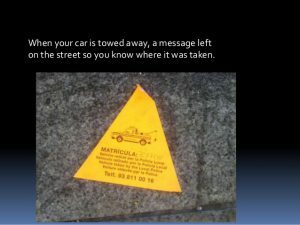 Matriculation -The importance of putting your car on Spanish plates. Nervous, we went to the police station, when an officer told us that they had towed it away as they had checked with the DVLA (they do this instantly) and found that the MOT had expired. Therefore, the car was not legal to be driven on the road in Spain. (By three days) However, this is the law applicable to all. The Police were very sympathetic and accommodating and advised us to ‘put the car on Spanish plates.’ Which, is not an easy thing to do with a car stuck in a Police compound. I will update you on developments on what happened with this shortly. However, the tale does not end there. Last Sunday morning, Paul was on his way to Alicante airport when at 8am he was stopped by a Police roadblock. Again, because he was driving a UK plated car. (This time an MGF) This car was legal, had an up to date Mot, Insurance etc. However, the Police were not happy. Advising, that there was a crackdown on all UK plated cars with no exceptions. So now we have to matriculate this second vehicle. So be careful out there. The last thing you want is for your treasured classic car to be impounded, but if it does not abide to Spanish law then it will be. For the record, this is the requirements of the law on UK imported cars. EU law states that when you first move to Spain from another EU country, you must re-register your car onto Spanish plates within 6 months of your arrival. If you are a Spanish Resident, then the time frame allowed is just 30 days and you will have to pay the Matriculation (registration) Taxes of up to 16% of the cars Spanish Fiscal Book Value. A person automatically assumes ‘Resident Status’ in Spain if they stay here longer than 183 days. It is also illegal for a Spanish resident to drive a non-Spanish registered vehicle too and it’s also illegal for a non-resident to keep a car here for longer than 6 months. Understanding all the technicalities and laws can be a minefield. You will hear many conflicting stories from so called ‘registration experts’ and you won’t know who to trust, what to do or where to go and the ball of confusion can blinker your thoughts. There will always be some people who don’t care what the laws are. That is until they get stopped by the Police or Guardia Civil and asked to produce their documents. And driving an illegal car becomes a huge liability if you are ever involved in an accident and try to make a claim to your insurance company. There are big problems facing anyone who gets caught driving an illegal car in Spain, as they can be impounded by the Police through lack of compliance with Spanish laws and may face a heavy fine too. Looks like Paul and I are going to be counting the pennies for a while to come yet. So just be careful and abide by the law.